At weaning the digestive system of piglet is not fully developed and the production of hydrochloric acid may be insufficient (Fig.1): when the pH of stomach maintains levels higher than 4,0, the feed proteins are not totally erased and the indigestible part reaches the intestinal tract providing the “pabulum” ideal for toxigenic bacteria proliferation with diarrhea and/or oedema formation . The main protagonist (although not the only one) of the phenomenon is the enterotoxigenic Escherichia coli, whose action is associated with the appearance of post weaning diarrhea (PMWD). The disease occurs worldwide and it is one of the major causes of mortality of piglets after weaning. PIGACID™ contains Formic Acid (E236)* and Lactic Acid (E270)** mixed with a technological additive that turns the product into gel. 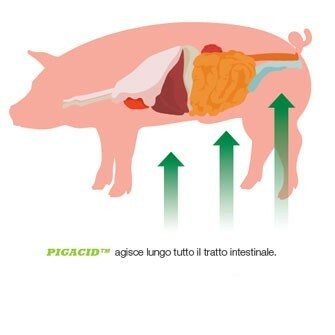 PIGACID™ is able to pass the gastric barrier and to dissolve slowly along the whole intestinal tract also reaching the last intestinal portion where it develops a real action of selection of the bacterial flora with marked antidiarrheal action. PIGACID™ maintains the integrity of the intestinal epithelium and the health and height of the villi. PIGACID™ does not cause ulcerations in the oesophagus and stomach.